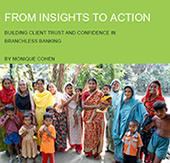 By Monique Cohen – Global October 2013, MFO’s Founder and past President, draws from recent studies conducted by MFO and Consumer Education and Branchless Banking Project CEBB in India, Zambia, and the Philippines to identify barriers that inhibit clients’ use of new technology and to explore how consumer education can effectively address them. The observations from the studies help form the main argument of the paper; which is that consumer education can help build trust and confidence in the use of new technologies, by facilitating uptake and use. E-money financial services are a hot topic. The excitement is palpable as banks, telephone companies, mobile network operators (MNOs) and others across the globe are jumping on the bandwagon, in part spurred by the experience of M-Pesa in Kenya that has witnessed meteoric growth, attaining 15 million customers in the span of five years. In all likelihood, these new providers entered this market assuming that anyone with access to a cell phone would grasp the advantages of branchless banking and adopt it. However, for many, success has been elusive. GSMA’s Mobile Money for the Unbanked State of the Industry Report 2012 indicated that at the time there were 150 live mobile money deployments, providing services to 30 million across the globe. However, no more 6 have active user rates in excess of 1 million and for a majority the active user rate is less than 25%. Despite high expectations for branchless banking, limited uptake and usage by low income consumers stand in the way of its potential to benefit clients and increase financial inclusion. The Consumer Education and Branchless Banking Project (CEBB) undertaken by Microfinance Opportunities (MFO) fills this gap. Drawing on the experience of Microfinance Opportunities’ Consumer Education for Branchless Banking (CEBB) in India, the Philippines, and Zambia, this paper identifies the barriers that inhibit clients’ use of new technologies and explores how consumer education can effectively address them. Market research revealed that the skills consumers need to adopt new technologies are learned rather than intuitive; that service providers have invited consumers to ‘leapfrog’ into the digital age without the necessary tools and as a result, low usage is largely a crisis of trust and confidence. Project partners designed and tested a suite of educational activities and tools to help clients move from high touch to low touch financial services, to understand how to manipulate the technologies to which they now have access, and to trust in the safeguards they contain. In the process, they experimented with two innovations: they broadened financial education content beyond basic money management to encompass trust and confidence in e-money services; and they developed a strategy for educational messaging that is embedded in service delivery.